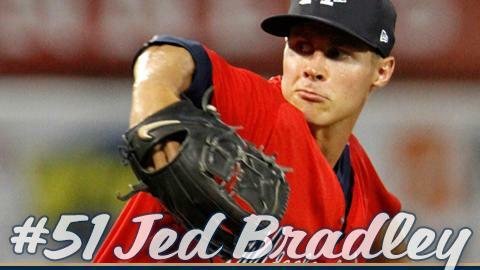 PEARL, MS -- LHP Jed Bradley was named Southern League Pitcher of the Week for the week ending Sunday, August 14. Bradley, 25, tossed seven shutout innings and held the Suns to just three hits while striking out eight batters as the M-Braves defeated Jacksonville 6-2 Sunday afternoon. In 15 games (10 starts) for the Double-A Braves this season, Bradley is 4-3 with a 2.35 ERA. Before joining the Braves, Bradley was 3-2 with a 6.20 ERA in 17 relief appearances with the Biloxi Shuckers. He split time last season between Double-A Biloxi (1-1, 3.31) and Triple-A Colorado Springs (2-4, 9.00), appearing in 23 and 20 contests respectively. The Huntsville, AL, native was originally selected by the Brewers in the first round of the 2011 draft out of Georgia Tech. Bradley was acquired by the Braves from Milwaukee and assigned to Double-A Mississippi on July 3.